Description: This small nudibranch is predominantly pink in colour, due to the orange-pink digestive gland in the many, crowded cerata. The cerata and rhinophores have pale tips, and the body is translucent white. The cerata are more numerous than in species of Trinchesia and extend along the sides of the head, in front of the rhinophores. Individuals begin to spawn at about 12mm. but may grow to 28mm in length. 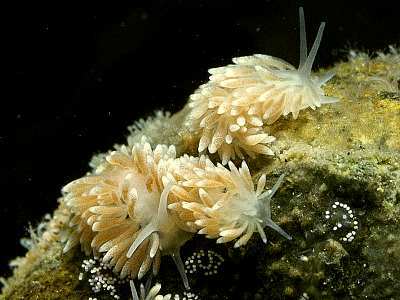 Habitat: This species feeds on Hydractinia echinata which is a pink, athecate hydroid normally found on hermit crab shells in sheltered, muddy localities. Convoluted spirals of eggs are usually laid on the shell where the animals have been feeding. Distribution: Found all round the British Isles, and elsewhere from Northern France, Scandinavia, Greenland and the Atlantic coast of N. America. Similar Species: The coloration of Catriona aurantia is similar, and these species have been confused in the past. Numerous cerata with pink digestive gland. Small white tips to cerata due to white epidermal gland cells. Unusual habitat, on Hermit crab shells with Hydractinia. Picton, B.E. & Morrow, C.C. (2016). Cuthona nana (Alder & Hancock, 1842). [In] Encyclopedia of Marine Life of Britain and Ireland.